During the official talks, the two leaders expressed their willingness to keep working to expand relations in areas such as trade and economy; they also discussed international issues. As part of Abe´s official visit here, representatives of both nations signed a document making official an upcoming donation by Japan of medical equipment for the Cuban health system. 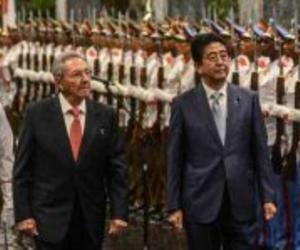 The document was penned by Cuban Foreign Trade and Investment minister Rodrigo Malmierca and by Japan´s ambassador to Havana Masaru Watanabe, in the presence of Cuban President Raul Castro and Prime Minister Shinzo Abe. Previously, Prime Minister Abe paid tribute to Cuban National Hero Jose Marti at the Revolution Square and toured the museum preserving documents of the life and work of the Cuban Hero. The Japanese Premier arrived Thursday in Cuba after participating at the 71 Session of the UN General Assembly in New York. His visit aims at deepening bilateral relations with Cuba at a time which is very favorable to strengthen and boost bilateral links, as agree by authorities from both nations.